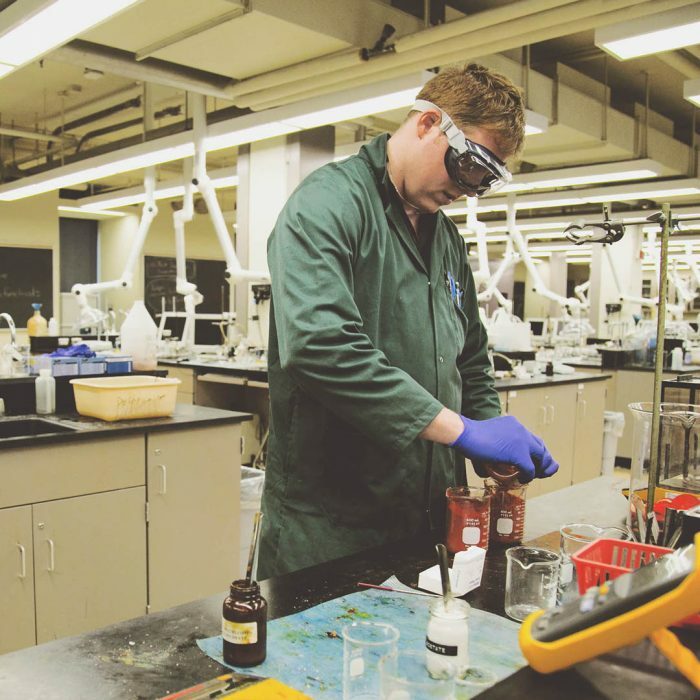 Chemical engineering technicians and technologists are at the heart of many growing fields, from leading-edge research around alternative fuels to protecting the safety of our food and water supply. 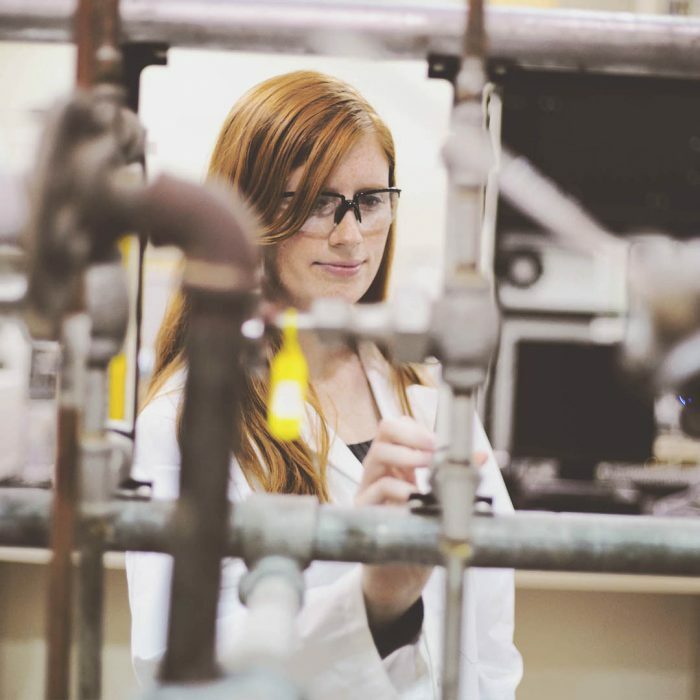 Prepare for an exciting career working in high-tech labs with real-world results. 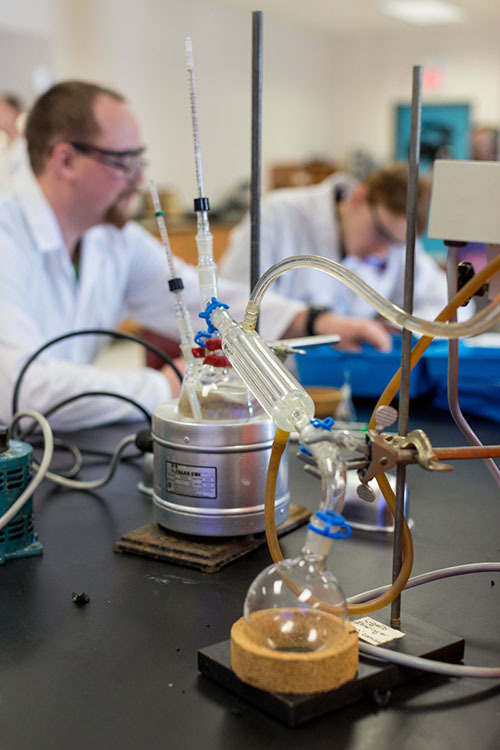 "My employers said they had interviewed many people with Bachelor’s and Master’s degrees but they liked the fact that I was able to explain to them how a distillation unit works. I actually drew a diagram in the interview." Laboratory Technician, Triangle Fluid Controls Ltd.
"I got offered the job. I’m excited! 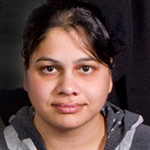 Three years at Loyalist was a great time and I had the best teachers ever." 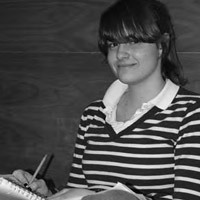 "I found myself in a friendly, laid-back atmosphere where everyone was more than willing to help me out. 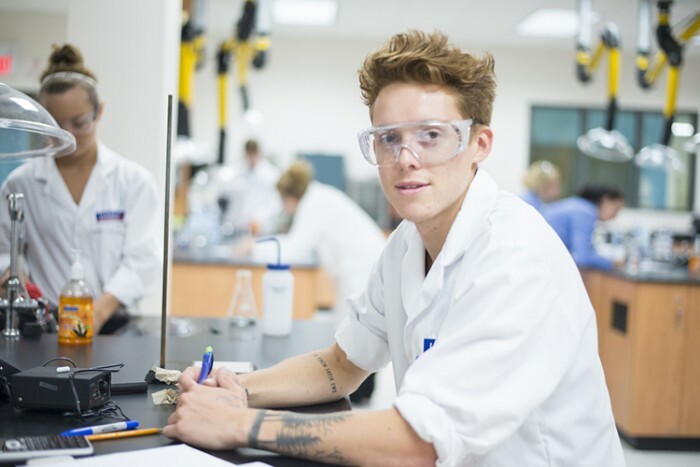 My favourite part of the program was that we were in the labs at least three times a week – the professors had so much practical experience that they were able to share with us." "I graduated from the Chemical Engineering Technologist program in 1975. After a brief stint in the food industry, I went to work for the paint industry at the DuPont Canada plant located in Ajax, Ontario. After working there for almost 38 years, I retired in January 2013. 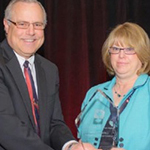 Last fall, I received the Industry Statesmen Award from the Canadian Paint and Coatings Association for my contributions to the industry and the association over the last 20 years. A fitting end to a long career." Industries including food production, pharmaceuticals, petroleum, plastics, pulp and paper, mining, metallurgy and nuclear energy. Lab Technician, Atomic Energy of Canada Ltd.
Have a good grounding in math and science. Understand the principles and techniques of organic and analytical chemistry, chemical engineering and industrial processes. 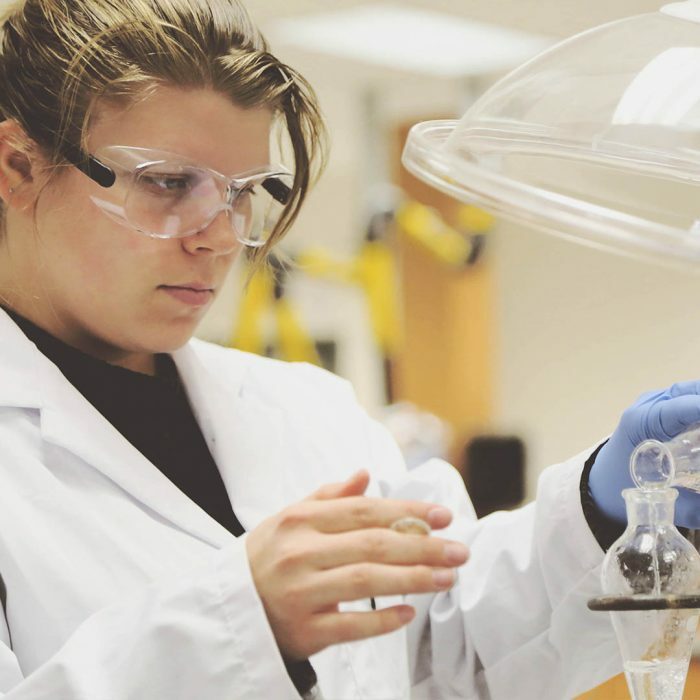 Gain applied skills with chemical instrumentation, extraction technology, health and safety, and microbiology techniques. Apply theory to practice with problem-based assignments. 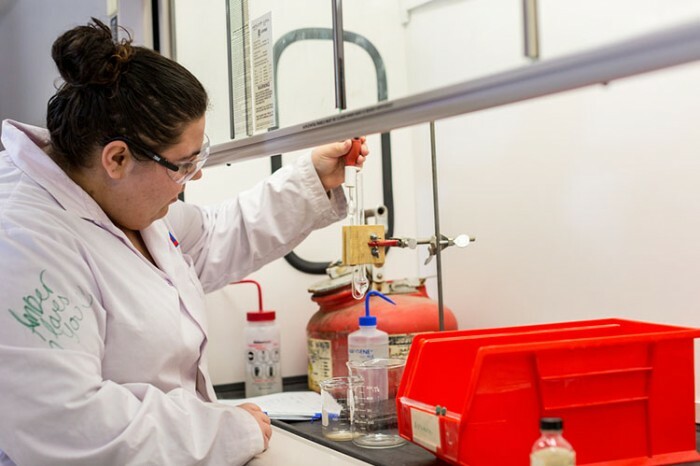 Graduates are prepared to work in research and development, analyze and interpret data, manage lab operations, assess analytical methods and develop new techniques. 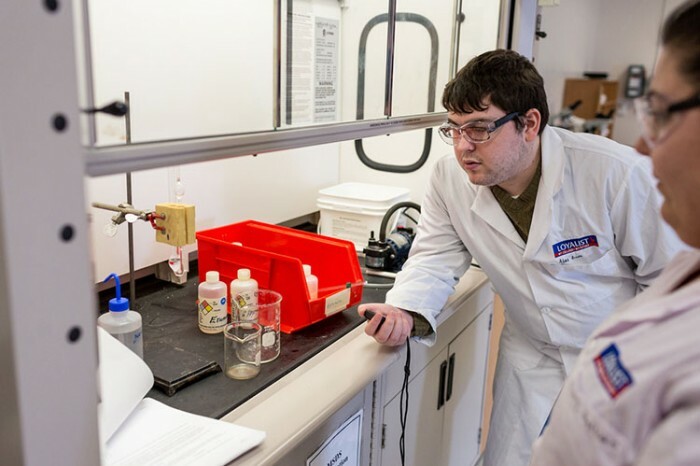 Observe chemical engineers in action with tours of professional lab facilities. The teaching labs were set up by a program coordinator who brings 15 years of experience working in three different countries as a research geneticist. This course is designed as an introduction to organic chemistry, with emphasis on molecular structure of the major classes of organic molecules, physical and chemical properties, and IUPAC nomenclature. 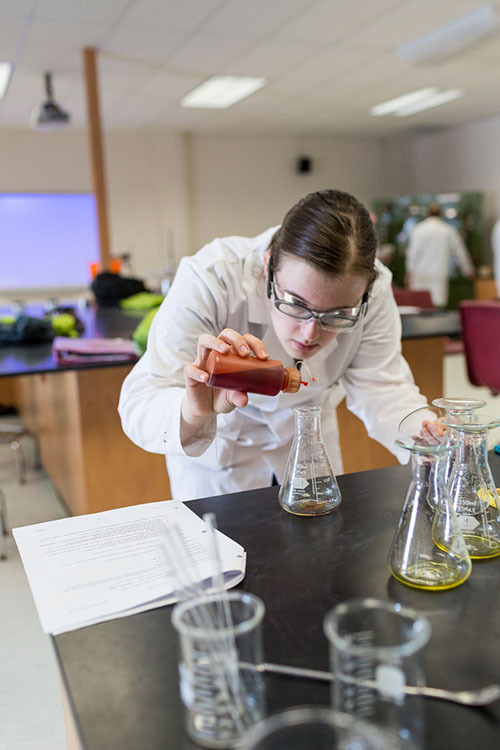 Students recognize the unique properties of organic compounds, and describe practical applications of organic chemistry to everyday life and biological systems. An introductory course designed to heighten familiarity with industrial processes via course lectures and field trips. This course is designed as a continuation of concepts and applications learned in Organic Chemistry 1. Students i) learn IUPAC nomenclature, molecular structure, and physical and chemical properties of major groups of organic compounds, ii) apply principles of stereoisomerism to classification and nomenclature of compounds exhibiting chirality, and iii) differentiate among types of chemical reactions involving organic compounds. 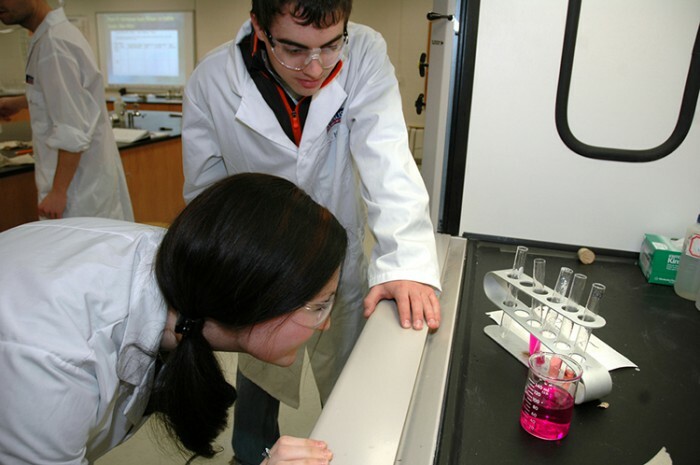 Emphasis is placed on the practical applications of organic chemistry to disciplines within the Biosciences. This is a companion course for Applied Organic Chemistry Techniques. 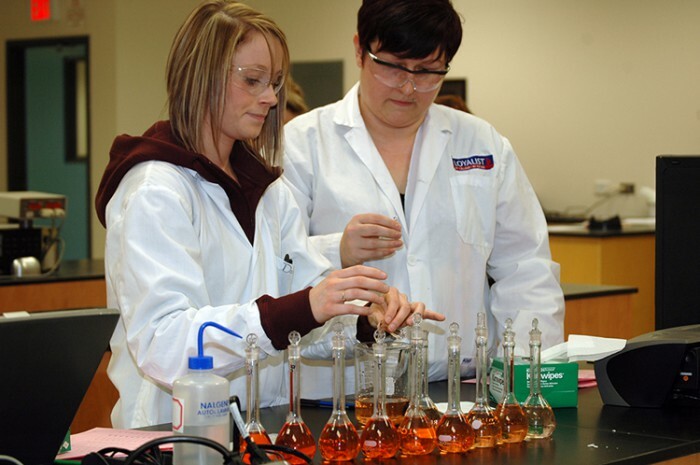 The labs performed in this course support the theory studied in CHEM 2001, Chemical Instrumentation 1. This course stresses the basic concepts and techniques of chromatography (thin layer, column, gas, liquid and ion) and spectrophotometry i.e. ultraviolet (UV), Visible (Vis), Infra-red (IR), Flame and Furnace Atomic Absorption (AA), conductivity, and specific ion electrodes i.e. fluoride. Specific types of quantative analysis and associated calculations are stressed, i.e. Ksp and solubility of slightly soluble salts (SSS), Ka, Kb, Kw, and the pH of acidic, alkaline and buffer solutions. Basic spectrophotometry and Beer's Law are reviewed. The topics of electrochemistry, the Nerst equation, Iodine Numbers, and Total Residual Chlorine are introduced. An introduction is given to the basic theory, calculations, unit operations and/or processes involved in fluid flow, heat transfer, distillation and evaporation. Lab exercises reinforce the theory. 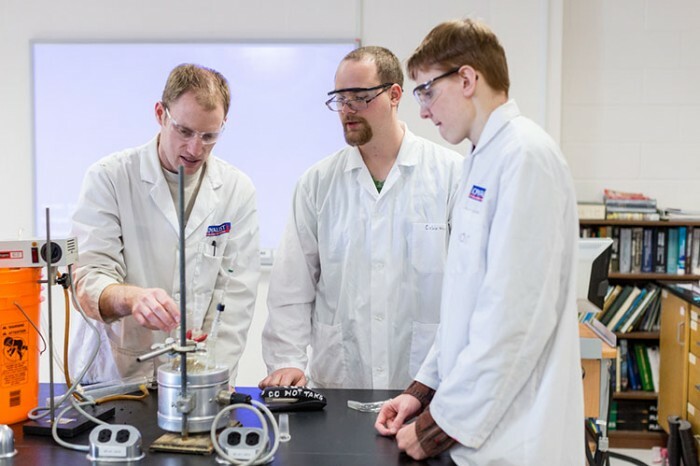 This course reviews some of the basic concepts and techniques of chromatography (thin layer, column, gas, liquid and ion), spectroscopy (ultraviolet-UV, Visible, Flame and Furnace Atomic Absorption). Fluorescence and Infra-red spectroscopy are introduced. 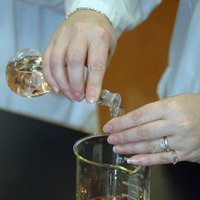 A variety of sample preparation techniques are carried out as various unknowns are analysed in the labs. This course introduces basic nomenclature, physical and chemical properties, classification, types and uses of the more common plastics. Other topics include theoretical aspects of the production and properties of various polymers. Typical polymer testing techniques are also discussed. This course deals with methods of instrumental analysis. Spectrophotometric techniques (absorption and emission) are discussed. Gas, high pressure liquid and ion chromatography are reviewed. BOD, COD and Kjeldahl determinations are introduced. Where possible, commercially available products are used as samples in the corresponding labs and different methods of sample preparation are emphasized. This course provides a one-semester investigation of biochemistry, designed to introduce students to the complex structure of cellular components, the function of biomolecules, and the dynamics of metabolic pathways. 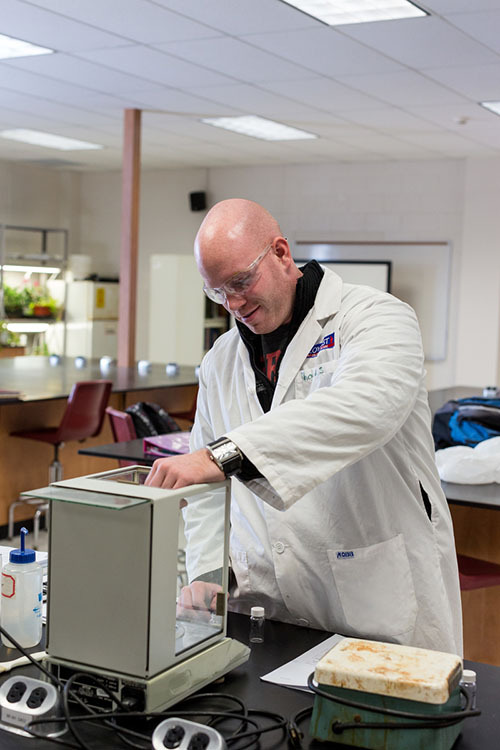 Based on theoretical and lab-based study, students will examine major groups of biomolecules (carbohydrates, amino acids, proteins, lipids, and nucleic acids), enzyme function, metabolism and inborn errors of metabolism. This course is designed to investigate the fundamentals of extraction technology and related applications. Topics covered include liquid-liquid extraction, solid-liquid extraction, Soxhlet extraction, ultrasonic extraction, accelerated solvent extraction (ASE), microwave extraction and supercritical carbon dioxide extraction. Theory will compliment laboratory exercises. This course covers the theoretical aspects of organic chemistry as applied to paper, column, thin layer, gas and liquid chromatography. This course combines Health Canada's Guidelines for Good Manufacturing Practices: Food and Drug Regulations, (as referred to Division 2, Part C of the Food and Drug Regulations) with the World Health Organization's (WHO) Basic Training Modules on GMP. 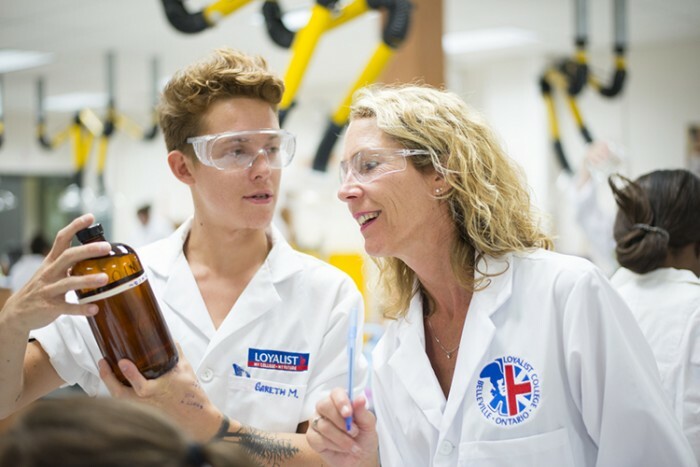 The scope of this course includes all GMP activities relating to fabricating, packaging/labelling, testing, distributing, importing and wholesaling of drugs for human or veterinary use. Division 2 applies to drugs listed is Schedules C and D to the Act. The course runs over a one-semester period as an online course using the Learning Management System. A facilitator will monitor participants and provide expert feedback and support. 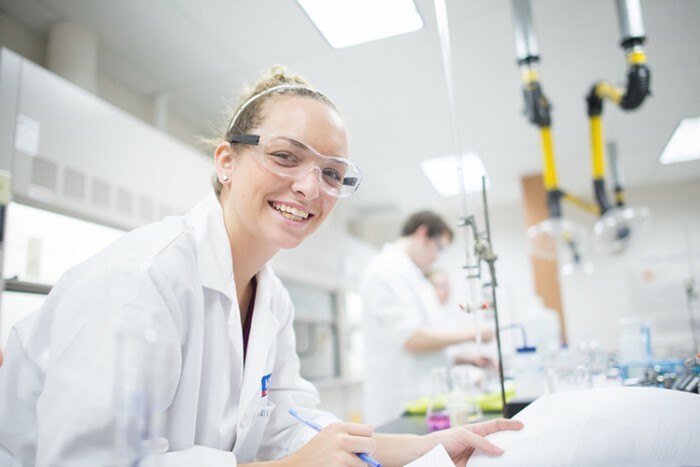 Algoma University – B.Sc. ; B.A. ; B.B.A. Carleton University – B.Sc. (Honours or General) or B.A. McMaster University – Bach. Tech. Manufacturing Engineering Tech.